This post is part of the Foodie Friday Blog Hop hosted by Talking Momcents! This Hop is in celebration of Foodie February, and will be running every Friday, Saturday, Sunday for the month of February. Its a great way to find yummy new ideas, amazing tips and tricks, and some great blogs. 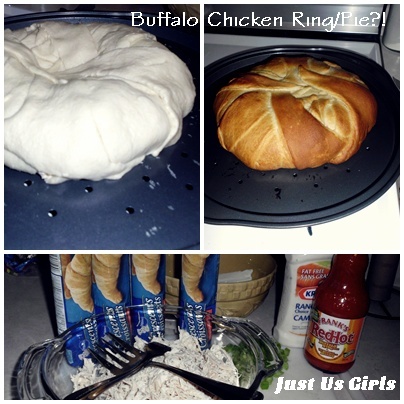 Earlier this week I made this yummy delicious recipe that I found on Pinterest. Although mines didn't turn out like a ring, more of a pie?! It still tasted delicious and the hubby loved it. Preheat oven to 375 degrees. On a cooking sheet, spread the unrolled crescent rolls out leaving a small circle in the middle. (As you can tell, my circle that was suppose to be left out, didn't come out that way, lol) Mix chicken and buffalo sauce to taste and add in celery. In separate bowl, mix cream cheese and 1/2 ranch packet together. Microwaving cream cheese for about 30 seconds makes mixing easier. Mix all ingredients together. Place spoonfuls of mixture on crescent rolls and fold rolls over to form a ring shape and cook for about 15 minutes or until crescent rolls are nicely browned. Serve with ranch dressing and extra hot sauce for dipping. You had me at Buffalo Chicken! This sounds delish! I don't know how... but the title of your post somehow got Beyonce's "Single Ladies" song stuck in my head.... "If you like it, then you should've put a ring on it..."
This is different but in a yummy way. Great for the next get-together.